This Angel Berry Trifle is so easy and perfect for Easter. 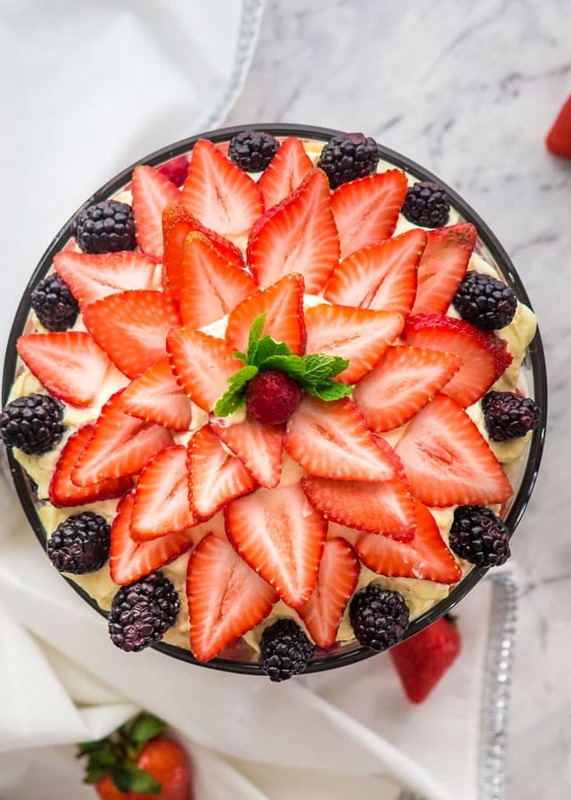 This berry trifle is made with angel food cake and an out of this world vanilla pudding cream cheese custard. 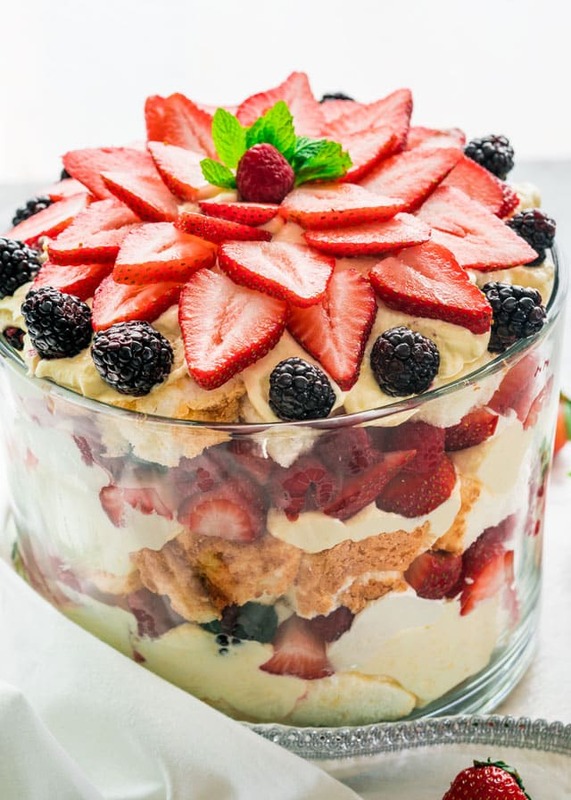 If a berry trifle made with angel food cake is not going to get you thinking of summer, I don’t know what will. This trifle is sunshine, it’s a glimpse of the summer we wish so desperately to come. This is the perfect trifle for an Easter brunch, especially when you’re in charge of dessert. The great thing about trifles is that they really are super simple to prepare and assemble. If you’ve never had a trifle before, I very strongly urge you to make this. 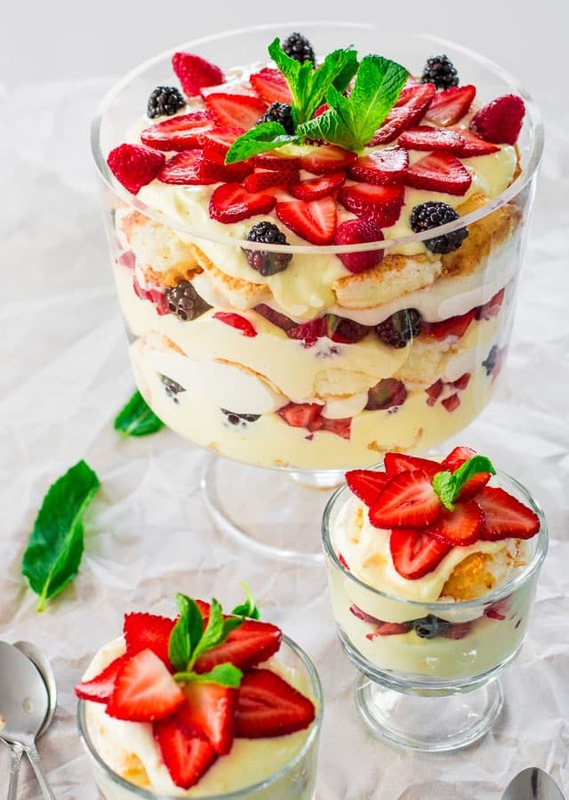 A trifle is usually a layered dessert made with berries or fruits, a cake of some sort, and whipped or custard layer. I, for one, simply adore trifles. The best thing about them is that they’re not as unhealthy as one may think. You can use fat free cream cheese, fat free yogurt and sour cream and sugar free pudding. Totally up to you! I find using low-fat/ low-sugar substitutes makes no difference in taste. Instant vanilla pudding – You can use any brand of pudding, just make sure that the package is 1 oz/ 28 g.
1 1/2 cups milk – I used less milk than what was called for on the pudding package. I wanted it to come out a little thicker to really help the custard layer hold together with all those fruits layered on top. Vanilla yogurt – I wanted this layer to turn out white to create beautiful contrast in the trifle. You can also use berry flavored yogurt if you don’t mind the color, it will taste awesome! Cream cheese – I used whipped cream cheese but regular cream cheese will work. Sour cream – Trust me here! I know it seems odd to put sour cream in a dessert, but it adds such a nice, smooth, rich consistency to the custard layer with a little bit of tang. Whipped topping – I used a container of cool whip, but you can whip up some fresh whipped cream if you prefer. Don’t use any whipped cream that comes from a can as it will liquify. Angel food cake – You can, of course, use homemade angel food cake, but I’m going for a fast and easy dessert here which is why I used store-bought. Strawberries, raspberries, and blackberries – You can use any berries you like. Blueberries would also be awesome here. Make the pudding layer – Using either a stand mixer with the whisk attachment, hand mixer, or whisk, combine the pudding mix with the milk until it thickens. Set aside. Add the yogurt, cream cheese, and sour cream to the bowl of your mixer and combine until smooth. Fold in the pudding and 1 cup of whipped topping. Assemble the trifle – Cube the angel food cake and place 1/3 of the cubes at the bottom of a 4 qt trifle bowl. Top with 1/3 of the pudding mixture, then 1/3 of the berries. Repeat, then arrange the final layer of berries as per the photo if you’d like. Serve – You can serve this trifle right away, or store it in the fridge until you’re ready to serve. The beauty of this trifle is that it’s pretty quick to put together, and you could easily use frozen berries as well. I used strawberries, blackberries and raspberries, but really you can use whatever you have or like. The only difference with using frozen berries is that they can be a little more liquidy, but don’t worry! Those pieces of cake will soak up all that amazing fruit juice. Can I Make Angel Berry Trifle in Advance? Yes, absolutely! Trifle has to be the best dessert to make ahead of time. The cake has an opportunity to soak up all those amazing flavors, and I think it actually gets better when it has a chance to sit and hang out. You can make this trifle up to 3 days in advance. Store covered in the fridge. If you make this in advance, I would suggest leaving the final layer of berries off until right before you serve it to avoid the juices bleeding. This is not a very freezer friendly dessert. 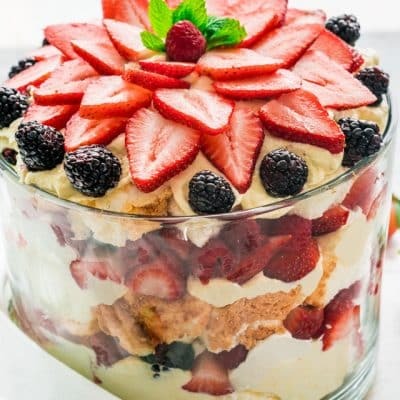 Since there is a lot of moisture both in the berries and the pudding layer, there will be a lot of liquid coming out and making your trifle soggy as it thaws. Looking for More Spring Time Sweets? Try These Recipes! 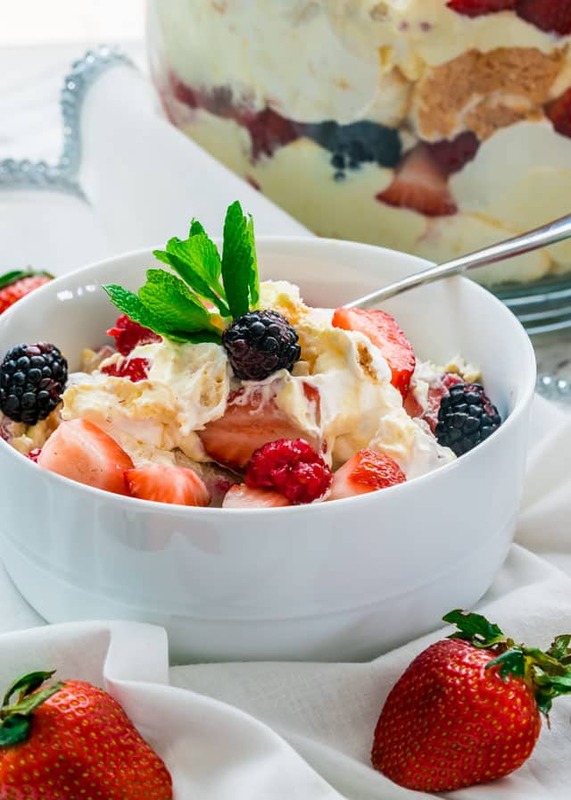 An Angel Berry Trifle that's perfect for Easter brunch made with fresh berries, angel food cake and an out of this world vanilla pudding and cream cheese custard. In your mixer whisk the milk and pudding mix together for a couple minutes or until firm. Pour into another bowl and set aside. In the bowl of your mixer add yogurt, cream cheese and sour cream and beat until smooth. Fold in pudding and 1 cup of the whipped topping. Place a third of the angel food cake cubes in a 4 quart trifle bowl. Top with a third of the pudding mixture, half of the remaining whipped topping and a third of the berries. Repeat layers once. Top with remaining cake, pudding and berries. I used a store bought already prepared angel food cake, but you can make your own and use that instead. Make sure to store this in the refrigerator because it has a lot of dairy so you don't want to leave it at room temperature for too long. 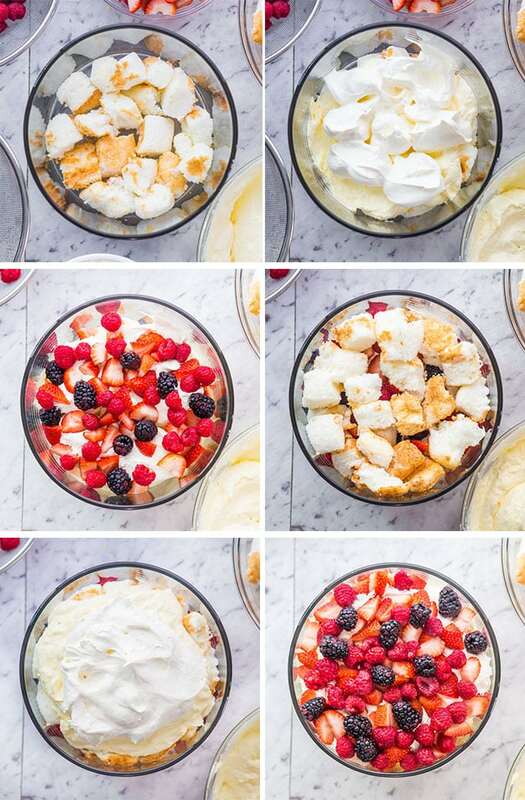 This trifle will last up to 3 days in the refrigerator. Perfect for make ahead. Trifles are great because you can make them the day before and the longer they sit in the fridge, the better they will taste. Originally posted April 2014. Updated with new photos, process photos and video. My sister past away Sat night. She did not want a funeral. She wanted loved ones and friends to come to her house and eat and fellowship. I saw this receipt and though she would have loved it. Thanks I will be making this for her. That’s great to hear, we’re glad it was such a hit!